This year's Vision Expo East in NY has been going quite swimmingly! Nothing but good news has been coming back from the east side. 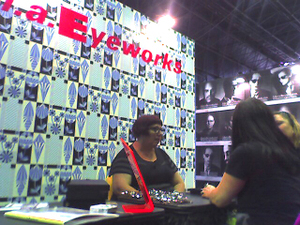 This picture was sent in over the weekend, and shows the great, new look of the l.a.Eyeworks booth, as well as the infamous Katie O. working with some close clients! There will be more trade show news to come, so stay posted! 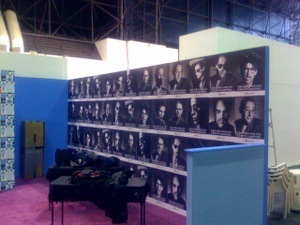 Tomorrow, the doors to the Jacob Javits Center are busting open! 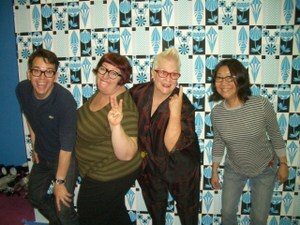 Vision Expo East 2008 will be kicking off, and l.a.Eyeworks is ready for anything! There will be more news to come the annual Trade Show continues throughout the weekend. 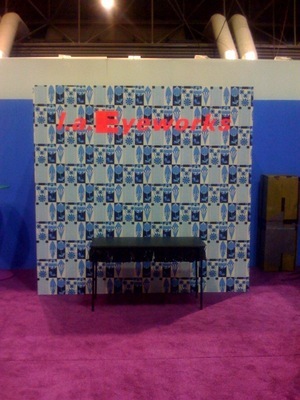 These images are the first to come in, and a glimpse of what the final setup of the l.a.Eyeworks booth will look like. Trés chic, indeed!! !